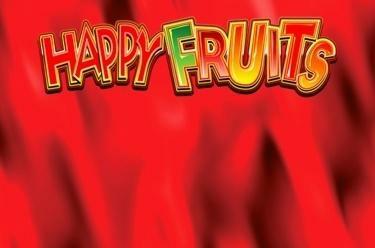 Play Happy Fruits online for free now! Happy Fruits will get you in the party mood! 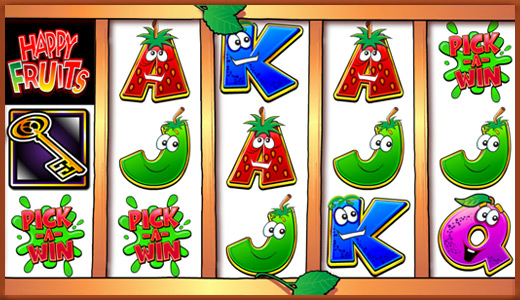 Get our fruity friends dancing across the reels, and ready your account for a landslide of Twists every time you land a winning combination! You’ll know it’s on when you spot the bonus symbols ‘7’, ‘Pick-A-Win’ or the golden key! Your aim is to land 5 matching symbols along a win line. Your winning patters run from left to right across the reels. To win, your matching symbols have to start on the first reel and lie side by side along the win line. The star symbol substitutes all symbols except for the 3 Bonus symbols. Splat Bonus: Land 3, 4 or 5 ‘Pick-A-Win’ symbols anywhere on the reels to trigger the Splat Bonus. Simply select a ‘Pick-A-Win’ symbol to win a multiplier. Your total current stake will be multiplied by this value. Super 7 Bonus: Land 3x ‘7’ symbols on reels 2, 3 or 4 to trigger the Super 7 Bonus. Select a '7' symbol and it will change its colour to either gold, silver or bronze and the multiplier's value will start to rise. Once the multiplier value stops rising, your total current stake will be multiplied by this value. The golden '7' symbol will result in the highest possible multiplier value, followed by the silver and then bronze '7'. Crazy Streak Bonus: Land 3, 4 or 5 Key symbols anywhere on the reels to trigger the Crazy Streak Bonus. You play on 3 reels. A display above the reels shows you each symbol in three-symbol combinations. The order shown in the display reflects the order on the reels. Click on ‘Start’ to spin the reels. The symbols you land on the reels are then lit up on the display above (e.g. land an orange on reel 1 to light up the orange on position 1 on the display, etc.). You will win a multiplier for every 3-symbol combination being lit up on the display. All winning multipliers are added together. This feature will continue until the 3 killer tomatoes below the reels are complete. The bonus feature will then come to an end and your final win will be displayed on the screen.